The electric food slicers we examined are not quite commercial-grade (though the 40 lb. Giantex gets closest), but are reasonably efficient meat-cutting solutions for home users (Source). They're marketed to handle meat, vegetables, breads and cheese with thickness controls enabling you to achieve paper-thin deli cuts, while also serving inch-thick cuts (Source). Older style models were crank-powered, while modern (commercial & domestic) options are electric-powered (Source). Buyers say it's best not to cut completely frozen meats, bone, foods with seeds (except tomatoes). You'll also want to ensure you use the fine-edge blades for thin cuts and serrated blades for hard crusts or fibrous foods. It's also recommend that they be hand cleaned after every use (Source). The best option we've seen is the 120 Watt Chef's Choice Electric Food Slicer. At its 1 mm setting, buyers find if you don't push too hard on the slicer, it creates uniform, deli-style cuts, without the motor slowing down. 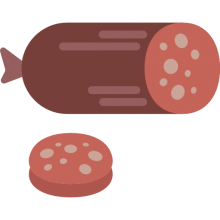 You might have to flip the meat a couple times as you progress because the meat might get thicker at its farther end (Source). The manufacturers also advise that you ​use a food-grade lubricant to lubricate it after you've washed it or swapped out blades. It's comprised of a food carriage, blade, food deflector, food pusher, and a thickness guide plate- you'll have to disassemble it to clean. This electric food slicer offered by Chef’s Choice is a good option if you are looking for a home-use meat slicer. Users like the construction and smooth operation of the product, but do complain about the durability and low power. This versatile and rugged slicer is made of cast aluminum and stainless steel. Its multi-purpose 7-inch stainless steel blade slices a wide variety of foods from deli-thin to 3/4-inch thick slices. It can be disassembled easily for cleaning. It has a lock feature to limit access to blade when the unit is not in use. This electric meat slicer seems like a good choice if you are looking for a versatile kitchen appliance with an easy-to-clean design. The general user consensus concerning the Chef’s Choice 615 Premium Meat Slicer is that it is well built, not too heavy and easy to clean and lube. They state that the slicing mechanism moves smoothly and that the food slicer has a great safety and storage feature. However, many buyers share that their item died after only several months. Plus, they complain about the low speed of the motor, which causes the blade to “smear” edges of the roast as you slice it. 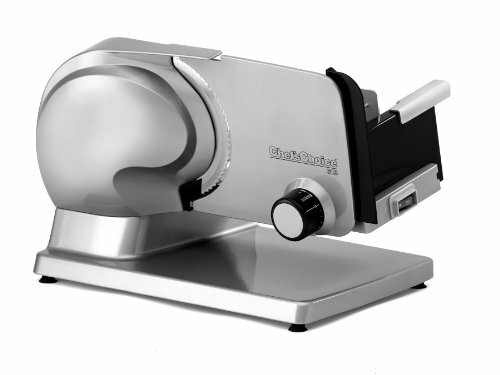 This meat slicer offered by Cuisinart is a solid option if you are looking for a professional-quality slicer. Users like the performance of this appliance, but do complain about the low RPM of the motor and some design flaws. This product features a removable 7.5-inch undulated stainless steel cutting blade, a stainless steel removable carriage and a slice control knob that adjusts from a paper-thin 1/32 inch to a thick 1/2 inch. All components are made of stainless steel and aluminum and are removable for easy cleanup.This Cuisinart Pro Food Slicer might be a convenient kitchen appliance. In general, users have a favorable opinion of the Cuisinart FS-75 Kitchen Pro Food Slicer.What they praise is that it is fairly easy to operate and clean, fairly small, easily storable and light-weight. Moreover, it works well for cutting near paper-thin slices, if you handle it the right way. However, many purchasers complain about the blade which operates at a low RPM. Some buyers say that the item is fairly noisy and that it has a major design flaw, namely the backing of the adjustment knob which moves during slicing. One purchaser advises not getting this product if you’re looking for a deli-style slicer for paper-thin cuts with almost no work to it. If you are looking for a top-rated meat slicer, you might want to consider this commercial electric food slicer offered by DELLA. Users love the efficacy of this appliance, but some do complain about poor performances. This product has a modern easy-to-clean design and is perfect for both home kitchens and restaurants. It features a built-in blade sharpener which keeps the blade at the optimal sharpness. If you want to buy deli meats in bulk, slice them when needed and then freeze the rest,this 8.7’’ steel meat slicer might be a solid option for saving time and money. In general, users have a favorable opinion of the DELLA electric meat slicer and they agree that it is solid, well-constructed and easy to clean. As they say, it does the job for a reasonable price and it is an effective appliance for home use. However, the main purchasers’ complaints regard the slow motor and the machine being under powered. One dissatisfied buyer shares that the product doesn’t have a built-in sharpener as described. She adds that the manual says it is for home use only, contradicting the ad. 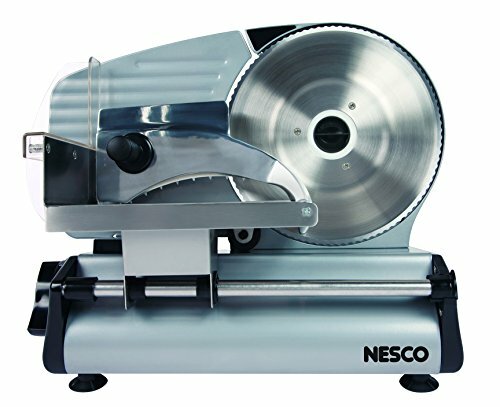 This 180-Watt food slicer offered by Nesco is a good option for those who need a full stainless steel meat slicer. Users love the performance of this appliance, but do agree that it is not suitable for professional use. This product features a large, detachable 8.7″ hardened stainless steel serrated blade. Other features include an adjustable thickness control knob for a 9/16″ thickness range and a dual safety feature.This food slicer could be a great addition to your kitchen. In general, buyers have a positive opinion of the NescoFS-250 180-Watt Food Slicer. They state that it is a great value for the price, light-weight, very easy to clean and (dis)assemble. Purchasers share that the blade is sharp and heavy and that the machine works smoothly. Most of them agree that it is a perfect slicer for home use. However,some buyers complain about it not being very powerful or super-fast. They state that if you need consistent, thin slices, then this unit is not suitable. If you are looking for a 150-watt food slicer, you might want to consider this electric 10’’ blade meat slicer offered by Giantex. Users like its usefulness in the kitchen, but do complain about it not being suitable for professional use. This product is a semiautomatic food slicer that features a dual hand-less system for slicing meat effortlessly. Other features include adjustable slice thickness, blade cover, built-in dual whetstones for sharpening the blade safely and conveniently. If you are looking for an industrial quality food slicer, this might be a solid option. 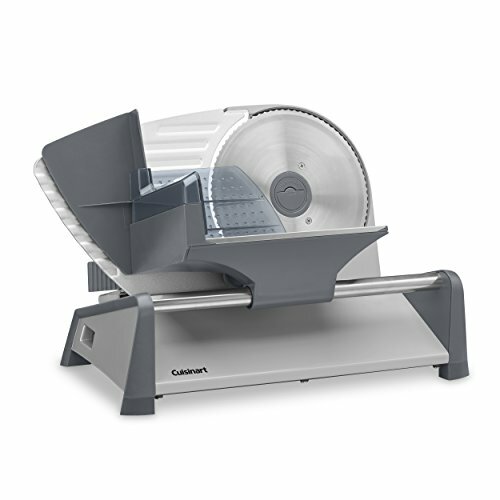 In general, users are happy with the Giantex 10’’ Blade Commercial Meat Slicer. What they like in particular is that it is heavy duty and quiet. All in all, they agree that it is a great slicer for home use and a good quality for the price. However, purchasers wouldn’t recommend it for restaurants or professional users since you need to slice the bulk item into thirds and quarters to fit on the machine.One buyer complaints about the appliance being a little hard to clean up. She adds that it spits food pieces out over the table. The first electric food slicer we examine is the Chefs Choice option- it is a stainless steel and aluminum built machine with a 7-inch steel blade. It features and integrated food deflector, food carriage, food pusher- all of these elements make it simpler for you to clean the electric meat slicer after you're done using it. Examining their promotional materials, they say that it's equipped with precision thickness control- this means that you can adjust the thickness of the deli cuts from ultrathin to 1 inch thick. Buyers we spoke to say that it's capable of cutting pepperoni down into thin slices, as well as shaving down entire ham sections into delicate slices for delicatessen sandwiches. One buyer we interviewed endorsed it as a frictionless option- the slider easily moves the meat across the stainless steel blade. Another deli owner told us that he has used it on prime rib roast as well as pre-cooked ham, saying that the ham was cut at a 1 mm setting and produced a neat pile of cleanly cut pork meat for the day's sandwich makings. In terms of cleanup, the device easily disassembles so you can sterilize it after a day's use, before reassembling it. Other buyers advise that in terms of safety, you'll want to keep your hands and fingers free and clear (possibly using cut-resistant gloves) of the blade- you'll also want to be careful when disassembling it that your skin doesn't come in contact with this ultra sharp meat-cutting blade. Another Chefs Choice buyer was similarly impressed, saying that he was pleased by the smoothness of the slicer, its solid construction, its relative lightweight and its one year warranty. On the downside, some buyers complained that the instructions were insufficient and customer service was somewhat nonexistent, and also observed you will have to hand wash rather than dish wash it. Another deli owner purchased an aftermarket non-serrated slicer edge blade to install- he also made sure to lubricate it with a silicone type of lubricant. This ended up being a mistake- the manufacturer advises you need to use a mineral-based food grade Vaseline to lubricate it after you washed it. Another buyer who purchased it to prepare thin deli-style sliced meats for his large family tells us that if you push too hard on the powered slicer, the resulting cuts will be thicker, while lighter pressure produces thinner results. The gist of the criticism is the buyer expectation that this inexpensive food slicer can provide commercial-quality results- some buyers responded saying that if you're looking for paper thin cuts of meat this is not the option for you. On the positive side, reviewers say that it's much easier than manual cutting, easy to use, can handle cutting bread, is a good option for bulk cutting, or if you are doing your own meat curing, and that it is a fairly small option. On the downside, buyers criticize the construction of the adjustment knob, the flimsiness of its plastic handguard, that you need to rest it after running it every 10 minutes, and the relatively low RPM. In terms of getting the best results, some experienced Cuisinart users say that the zero setting will get you closest to paper thin cuts, though the results are not always consistent. Indeed, buyers say this is a value option that is not really commercial grade, but can be a functional accessory for home kitchens. Other buyers who cook large quantities of meat and are left with hunks of leftovers say they've used it for corn beef and pot roasts, slicing them down to create sandwiches for the whole family. The third commercial electric meat slicer we examined is manufactured by Della. It comes in 8.7 and 7.5-inch blade length designs and includes an integrated blade sharpener to maintain the cutting edge. Examining their promotional materials, they say that this deli meat slicer can handle vegetables as well as traditional deli meats- providing a commercial solution for the bulk cutting requirements of the user. One buyer criticizes the slow functioning motor and the tendency of meat to get stuck in between the guard and plate- this makes it especially hard and annoying to clean. Another reviewer who cures bacon at home tells us it is a tremendous upgrade over manual cutting- enabling thinner slicing much faster. However, other buyers were under impressed, saying that it is slow, difficult to use, and cheaply constructed. The fourth food slicer we examined is manufactured by Nesco. 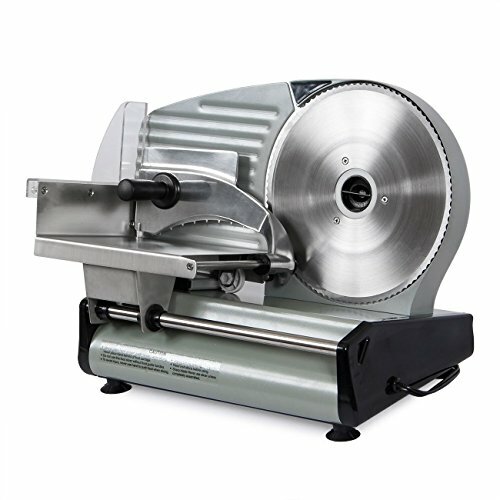 It features a detaching 8.7-inch blade and is marketed as a vegetable, cheese, bread and meat cutting solution powered by 180 W motor. One buyer says that it's not quite a professional-standard option. However, for his salami slicing purposes, it has served him well. Because it weighs under 12 pounds, it's fairly portable and doesn't take up much space-though it's somewhat annoying that you can't run it for longer than 10 minutes at a time. As well, while the blade is over 8 inches in diameter, the cutting height is 6.5 inches, which means that you often have to cut down a section of meat to fit the slicer. Another buyer who has worked in restaurants his whole life says that while it is inferior to a much more expensive commercial-grade option, he can endorse it as suitable for home use saying he even cut a frozen ham with it. On the positive side, because it disassembles into three different elements, it's much easier to clean than more powerful restaurant-style options. Indeed, buyers have expressed relatively positive feedback, saying that it sufficiently powered for home use, though the blade does turn a bit slow while turning out pastrami, corn beef, Canadian bacon and dried beef. The last commercial meat slicer we examined was the Giantex- it is an aluminum built, 150 W option with a 10-inch blade diameter. Buyers say that this semi-automatic option includes adjustable thickness settings. On the whole, buyers say vegetables and meats were a cinch to slice, but the unit was somewhat troubled by cheeses which stymied the blade. Others are impressed by the quiet motor, though they also complained that for thicker cuts it had some trouble performing a smooth and consistent slice.